Siemens is supplying eight Vectron DC type locomotives for operation in Italy. The DB Schenker Rail freight operator has a leasing contract for the locomotives with Unicredit Leasing GmbH. The vehicles are to be put into service from late 2016 onwards. With a maximum power of 5,200 KW, the top speed attained is 160 km/h. "With this order and the future deployment of these locomotives, DB Schenker Rail will be able to continue improving its competitiveness in Italy," said Rüdiger Gastell, Managing Director DB Schenker Rail Italia. "Again, DB Schenker Rail has chosen the Vectron DC. 23 locomotives have already proven their worth in freight transport operations in Poland. Now the same type is to be used in Italy. Our locomotives are well equipped for this new mission. Basic approval for Italy has already been obtained, so that the delivery time can be shortened considerably," said Jochen Eickholt, CEO of Siemens Mobility Division. On their way to Italy today: UniCredit 191 016 and 017, to be operated by DB Cargo in Italy. Michael Raucheisen caught them on camera together at Brenner. Portraits of the new 'reds' in Italy: UniCredit > DB Cargo 191 013, 014 and 015 by Marco Stellini. Update: thank to Riccardo Mainoldi we can show a picture. Indeed, new red painted Vectron locomotives are in the making, in Munich. Siemens has started the production of loocomotives for UniCredit. This bank / leasing company ordered eight Vectron DC machines in November 2015. They will have the same livery as the red Vectron DCs (series 5170) currently operated in Poland. This because the operator is the same company, DB Cargo. 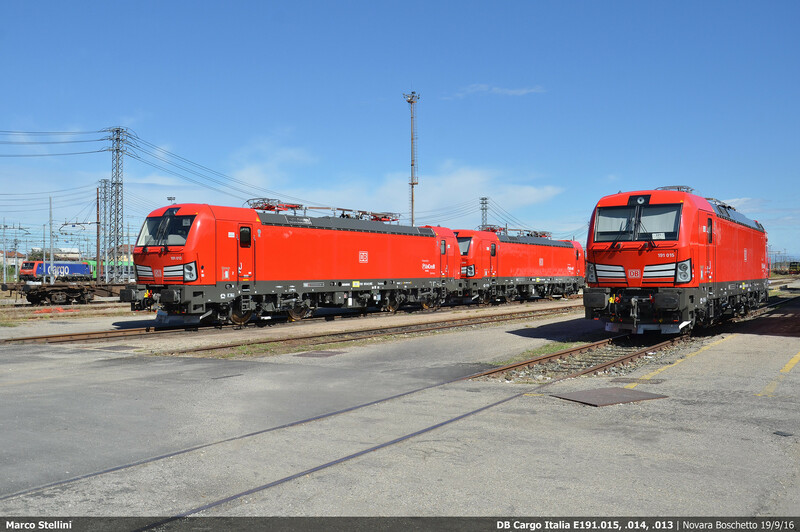 So, DB Cargo Italia will soon get its first Vectron DC locomotive. Its number? 91 83 2191 013-8 I-NC. All parties in involved are no stranger to one another. DB Schenker also has Unicredit as partner for financing Transmontana locomotives for its Romania department. In Poland, DB Schenker already operater Vectron no. 5 170 035-057.